Purpose: The purpose of this experiment is to find the relative percentage of strawberry flavored Mentos in the Mentos Assorted fruit pack. Hypothesis: In this experiment, since there are 3 different flavors of Mentos in the assorted fruit pack, then it is assumed that one out of every three Mentos is strawberry, therefore, since a pack contains 14 candies, it would be assumed that 4 or 5 of them be strawberry. The Equipment: The equipment for this experiment include, 8 Mentos packs, one calculator, a pen, a piece of paper, and containers for the Mentos. Conclusion: Given the data, and margin of error, it is conclusive that indeed the hypothesis is correct, and Mentos are in a perfect ratio, as far as candy distribution. 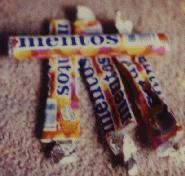 Further research and additional information: The Mentos experiment has yielded some "surprising" outcomes. The most notable, which is assured to lead to some further research into the issue, is the fact that not all packs of Mentos contain 14 assorted candies. In the current experiment, 8 packs were tested, and yet only 111 candies were counted. one was missing. Does this mean that in a such pack of 13 candies, that a supersized candy exist? Besides this, here are some other interesting facts.